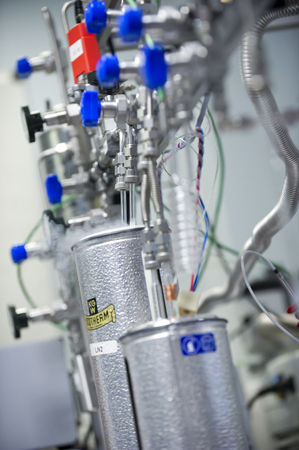 The carbonate group operates the "Qatar Stable Isotope Lab", with new instrumentation purchased using research funds allocated to us by the Qatar Science and Technology Park (QSTP) in the framework of a $70 millions project on carbon capture and storage (QCCSRC). Currently, we operate one MAT 253 mass spectrometer (photo, right) that was installed in mid 2010, and measure both conventional isotopes (δ18O and δ13C) and "clumped isotopes" (or Δ47). 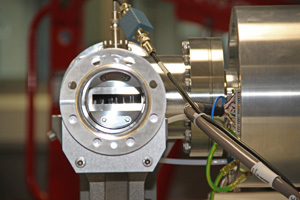 A second mass spectrometer is on order, which will allow dedicating one machine to clumped isotopes and one to conventional stable isotopes. Traditionally, the MAT 253's setup to measure CO2 from acid-dissolution of carbonates have three collectors registered for masses 44, 45, and 46. This allows for δ13C and δ18O to be measured. 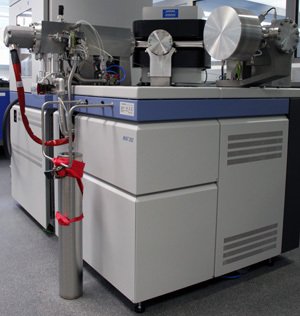 However, the 'clumped isotope' paleothermometers relies on accurately measuring δ47, and therefore the machines at Imperial College have modified collector arrays (photo below, right) that allow the simultaneous measurement of masses 44 to 49. This setup is similar to other clumped isotope labs such as John Eiler's at Caltech or Hagit Affek's at Yales. The major issue with measuring δ47 in CO2 is the very low abundance of this mass (in the ppm range), which implies that any contaminents could recombine in the source and produce spurious peaks of mass 47 that would throw the analysis off (see Huntington et al., 2009, for discussion of contamination in clumped isotopes). 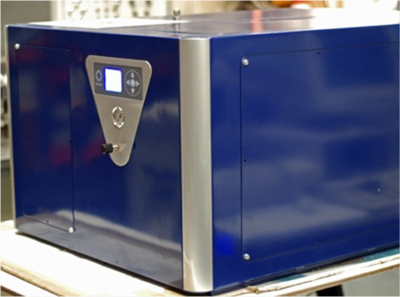 Therefore, the CO2 gas produced by acid digestion needs to be cleaned prior to analysis. The carbonate group has build a series of manual vacuum lines (see photo on the left) that permit cleaning of the CO2 gas through a poropak column following protocols highlighted in Dennis and Schrag, 2010. The principle of each line is to 1) allow online digestion of carbonates to liberate CO2, 2) trap water in a series of slush traps, and 3) trap any non-water polar contaminants (hydrocarbons, halogenids, etc..). After removal of all contaminants the purified CO2 is analyzed on the MAT 253 mass spectrometer to simultaneously measure Δ47, δ18O and δ13C. A normal measurement cycle is about 1.5 to 2 hours, and each sample is measured at least three times. How are clumped isotopes measured? In principle, clumped isotopes are based on measuring the difference in the abundance of the doubly substituted isotopologue of mass 47 (i.e.δ47) between a given sample and the expected stochastic distribution of the sample. The difference between the stochastic distribution and the actual distribution in a sample is what is measured for the clumped isotope paleothermometer (or Δ47, more about the principle of clumped isotopes here). However, subtle non-linearity effects in mass spectrometers arise, and a correction needs to be applied. In practice, the initial correction comes from measuring a 'heated gas line', i.e. a series of gases of different bulk isotopic composition (and thus different δ47) whose Δ47 values are pushed to stochastic distribution by heating the gas for 2 hours at 1000°C in a muffle furnace. The figure in the right represents the heated gas line obtained for a 2 months window at Imperial College. The heated gas line can be considered as a primary reference frame, using the terminology of Dennis et al., 2011. When an unknown sample is measured, the difference between it's Δ47 and that of the heated gas line is termed the Δ47[SA vs HG]. Because the heated gas is considered as stochastic, Δ47[SA vs HG] is de facto a measure of how far from stochastic the abundance of the doubly substituted isotopologue is (see Huntington et al., 2009, for in depth discussion of the heated gas line and the primary reference frame). This parameter needs to be corrected for stretching and acid fractionation (see Huntington et al., 2009, Guo et al., 2009, and Dennis et al., 2011), and can then be converted to temperature using for instance the calibration of Ghosh et al. (2006a). 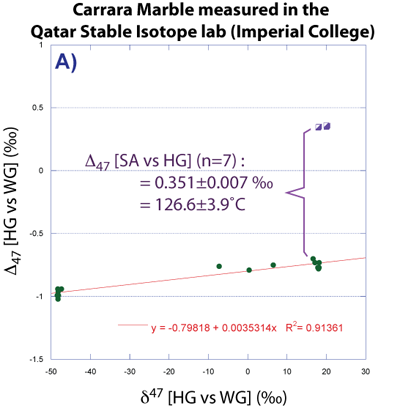 The figure on the right illustrates this primary reference frame showing carrara marble analyzed at Imperial College. The difference between the heated gas line and the sample Δ47[SA vs HG] is converted into temperature using the Ghosh et al. (2006a) calibration, and yield a temperature range of 127±4˚C, in agreement with measurements in other clumped isotopes labs (Caltech, Yale, Harvard and Zurich). In recent years, a second (or absolute) reference frame was proposed based on measuring a heated gas line and in addition a range of CO2 gases equilibrated with water at known temperatures (Dennis et al., 2011). This absolute reference frame, based on at least three lines (typically heated gas, i.e. 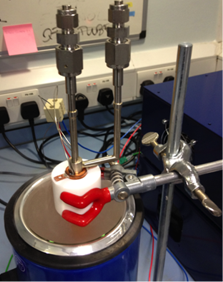 stochastic, 50˚C equilibration and 25˚C equilibration) improves interlaboratory calibrations. 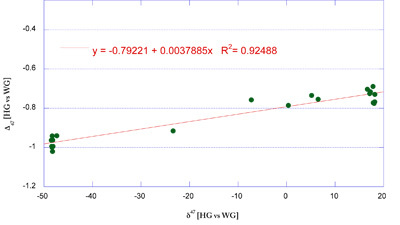 The theoretical clumped isotope value for a simple CO2 gas equilibrated at a known temperature can be calculated using the laws of thermodynamic, and the difference between the actual result and the theoretical result forms the basis of this new absolute reference frame. The clumped isotope paleothermometer is a very powerful method, but it is also very slow: measurements on the mass spetrometer take up to two hours, and the manual line is very work intensive and requires specialized training. This greatly limits the number of samples that can be processed in one day, and also limits accessibility of clumped isotopes to specialized individuals. An obvious workaround is to develop automated systems for clumped isotopes. Our group is working in collaboration with Protium (a company specialized in developing and marketing peripherals for mass spectrometers) on developping an automated device for clumped isotope analysis. We call this automated system the "Imperial Batch EXtraction" system, or IBEX. The acronym IBEX is also refering to the Nubian Ibex, a caprinid native to the Arabian peninsula, which highlights the roots of our funding sources for this project (the QCCSRC project). The photo on the left shows the chassis of the prototype of the IBEX as it stands currently in our lab. The chassis, vaccuum line, valving and all of the electronics of the IBEX have been finalized and built. We are now working on manufacturing and testing the various traps for the IBEX (photo on the right shows one of the water traps being tested). The IBEX will have a 50 position autosampler, a common acid bath maintained at a temperature selected by the operator (we are aiming for 70˚C), two water traps, two CO2 traps, and one hydrocarbon trap. An inlet port allows for the introduction of sample gases, for instance heated gases. The IBEX will also be fitted with an LN2 auto-refill system, meaning that the instrument should be able to run continuously without human intervention. Assuming 2 hours per sample, a full sample carousel should take 100 hours to run, or just about 1 week. Because the IBEX is still in development, it's actual performance metrics and optimal sample load will need to be tested. We are hoping to have the prototype of the IBEX running by the end of the year. The goal is to commercialize this product, thus giving access to automated clumped isotope analysis to a large number of stable isotope labs. This will promote more diverse and widespread research on clumped isotope, and the resulting advances and discoveries will benefit the clumped isotope community as a whole.